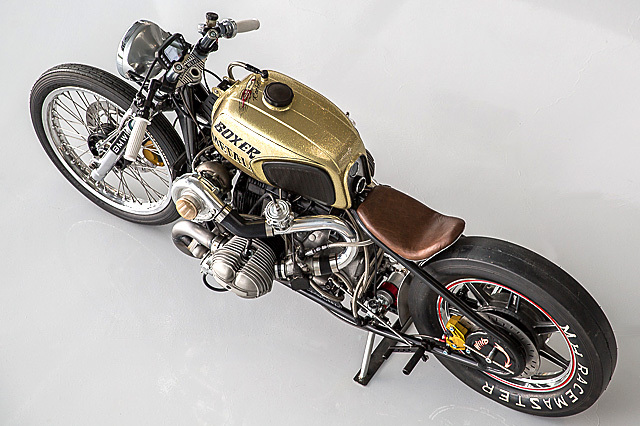 The custom bike scene is full of builders pumping out café racers, trackers, bobbers, scramblers and just about anything imaginable. 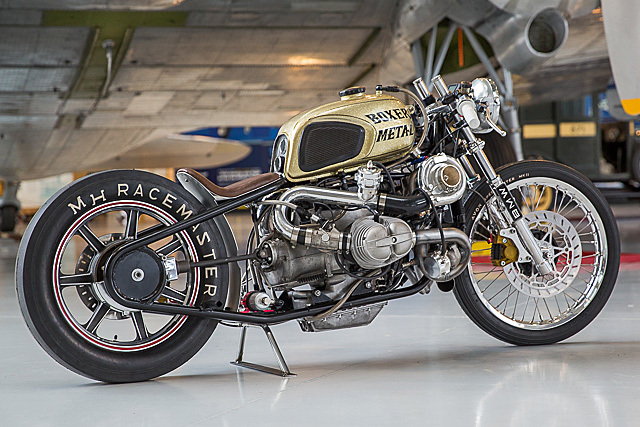 Yet Chris Canterbury, founder and owner of Boxer Metal in California, still managed to knock one out of the park with his fantastically unique 1980 BMW R100 twin turbo build. “We were excited to attend the One Moto Show in Portland again, but the bike that would have been perfect for it was already packed up and shipped to Guatemala,” says Chris. It didn’t make things easier that the One Moto Show was merely 7 weeks away. 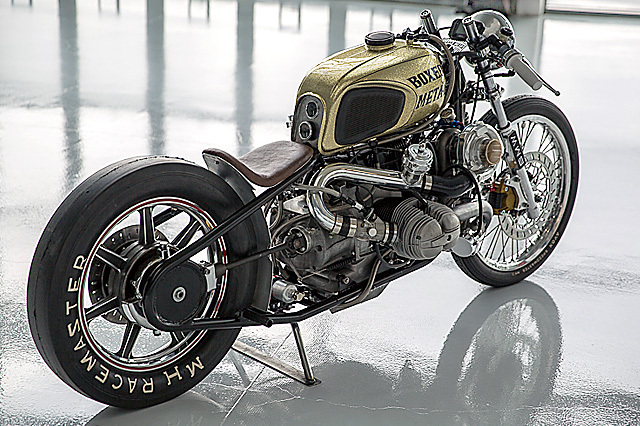 Not afraid of a challenge, Chris set out to not only build a bike for the show, but to build a BMW that would really stir things up. It takes a great deal of engineering and ingenuity to fuse one turbo to any bike, but two is more than any kid could ever wish for. For some time now, Chris had wanted to go back to the drawing board and create another rigid frame BMW. He had noticed that a number of people around the world were putting turbos on BMW boxers, so he said to himself “why the hell not.” This was his opportunity to finally set in to motion his 15 year dream. 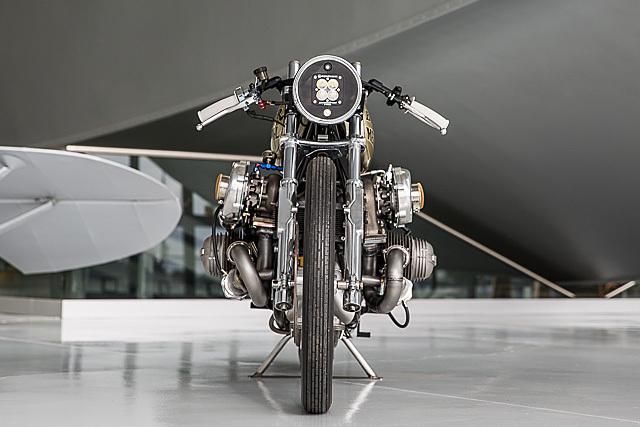 One of Chris’ first tasks was to ensure he’d have a functional build that rode just as well as it looked, so he began drawing out the details with a helpful nudge from Ola Stenegard at BMW Motorrad Germany. The donor bike was stripped down so that every single component could be inspected, rebuilt or replaced. Then, with a bare frame, it was carefully sanded and prepped for the rigid treatment. Chris wanted to be sure that the frame could sustain the forces of the turbos, so every inch was strengthened with larger diameter steel. This included extra bracing at key structural points so a rider doesn’t get that drifting feeling that is all too familiar for hardtails. The frame was then powder coated by his good friends at Hot Coats. The next goal was to have a solo seat integrated into the design that looked both natural and ultra clean. 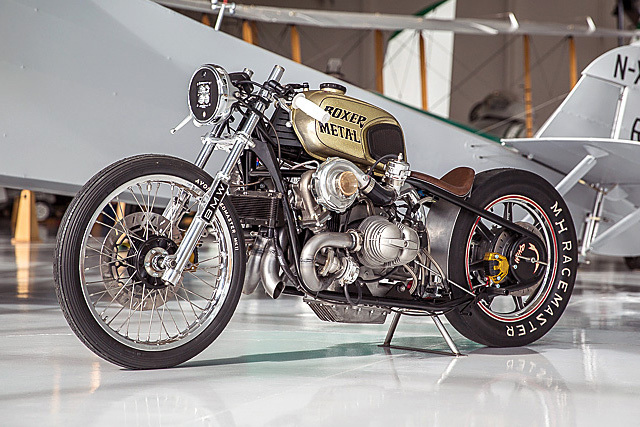 The seat pan and fender were made in-house at Boxer Metal, and the upholstery was done by Quality Upholstery. With the new lowered stance, the seat position helps the bikes center of gravity and moves the rider further forward for increased front end feel at high speeds. 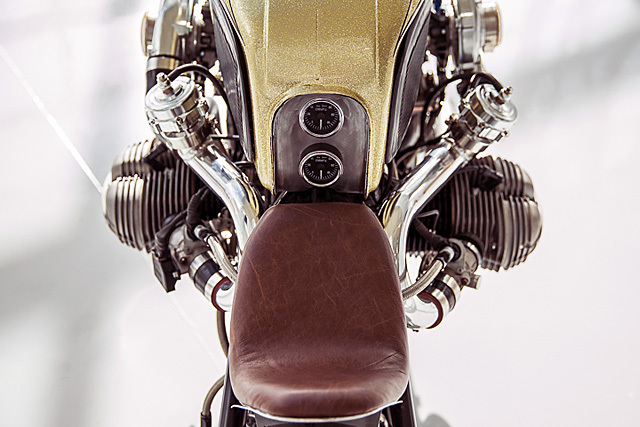 With BMW R series bikes being the go-to build these days, Chris knew a little design diversity was needed. He started with a Dnepr gas tank, both painted and pinstriped by Dennis Price. The beautiful color scheme seems reminiscent of a Harley ‘meets’ BMW love child. The gold candy flake might be the dominant color, but the accents and pinstriping help to bring the build full circle and let it shine in all its glamour. 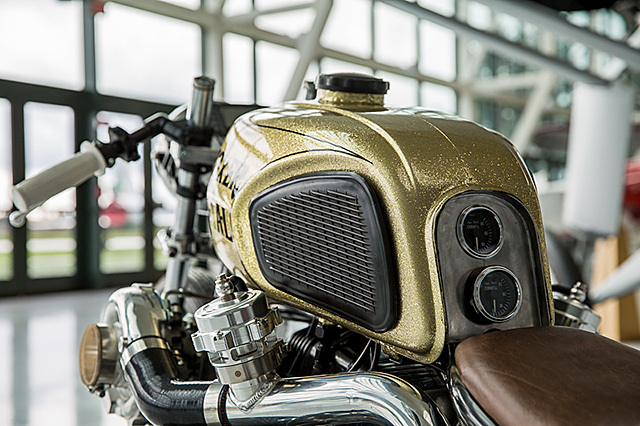 The top of the tank features a new custom Toaster Tan alloy top cap. The old springs were replaced with a nice set of progressive forks, and the braking received special treatment with a custom 320mm Boxer Metal big brake kit. 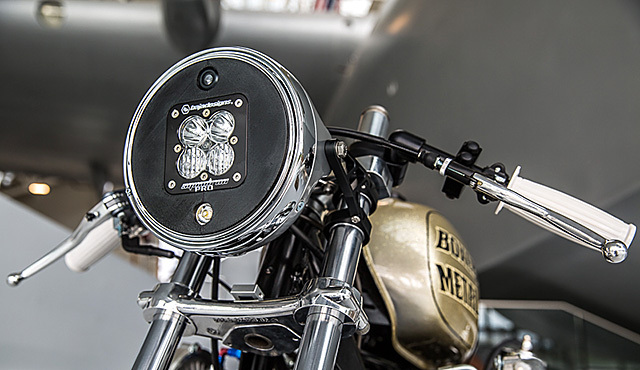 Chris also built a set of clip-on bars matched with master cylinder grip controls. The rear wheel is a vintage Lester Mag that was modified to fit a disc brake for even better stopping power. 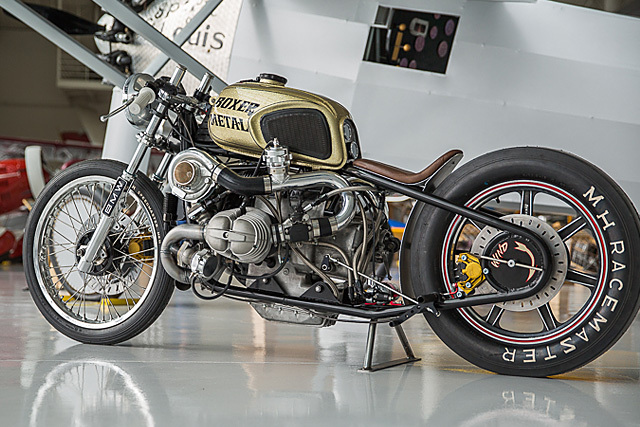 As Chris spoke about his path to building custom BMW’s, it was clear he is a true enthusiast. It was also this path that lead him to meet his inspirational partner Rebecca. Both Chris and Rebecca are very familiar with the BMW world, and have experienced the highs and the lows, the normal and the weird. Occasionally, a moment comes when you can build something just as wild as your imagination. To make sure the BMW lived up to both of their expectations, they worked tirelessly side by side to bring their ideas to life. This dynamic duo makes a great team, sharing their ideas and combining their styles to create bikes that are truly great. 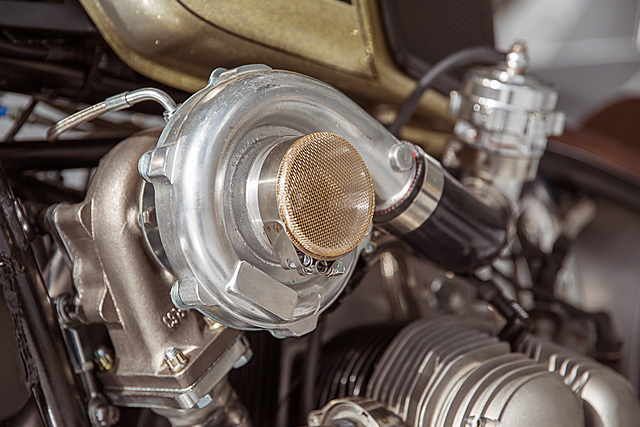 The heart of this Boxer Metal build is, of course, the much-loved 980cc horizontally-opposed boxer twin. Chris knew that with a turbo, carbs just wouldn’t cut it, so he opted for a fuel injection setup. No corners were cut and all new seals, gaskets, bolts and leads means the rider can take it easy and just let the BMW clock up the miles without fear of breaking down. And by adding in the Mega squirt setup and dual Speed Daddy T3 turbos, we know those miles will be enjoyable as hell. Since Chris was doing a braided theme, he decided to add braided brake lines from Spiegler USA as well. 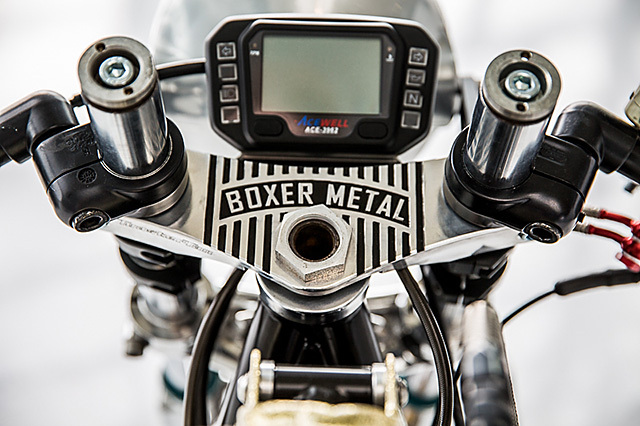 To give the bike some bark, the standard pipes were ditched for a fully custom set-up, also by Boxer Metal. A new anti-gravity battery is securely held in place and well out of sight. With the finishing touches almost done, the headlight had to be designed and 3-D printed by Minone Designs and intergrated with the Acewall instruments. With barely any time to spare, the LED lights from Baja Design were put in, and a nice buff from Ted’s Metal Polishing had this build looking gorgeous and ready to go. Chris and Rebecca packed up and drove straight to the One Moto Show in Portland. Chris and Rebecca would like to thank the following individuals for their friendship and assistance with this project: Alex Frantz, Sean Nguyen of Hoptown Fabrication, Artie Cathcart of TCB Fabrication & Repair, and Brian the Lion for helping keep the shop glued together on the weekends. 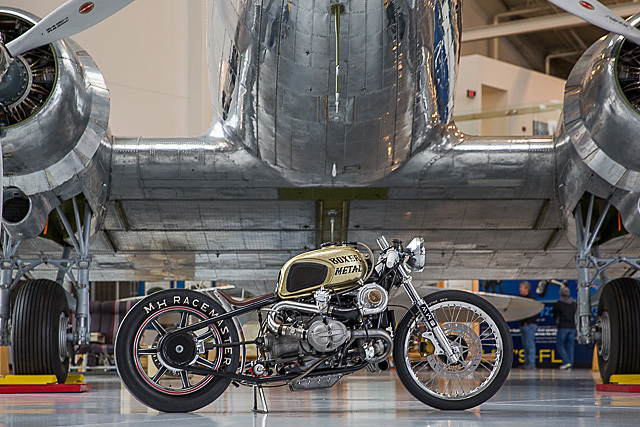 We would also like to thank the Evergreen Aviation Museum for allowing us to use their space for the shoot. And as much as we wanted to, absolutely no burn-outs were executed next to the Spirit of St. Louis. It will come as no surprise that Chris and Rebecca won the BMW-sponsored “Motorrad Award” for the bike. We’re sure there are no words that can clearly match the feeling of exhaustion and satisfaction that they felt after finalizing this build, rolling into Portland that rainy Friday morning and unloading their masterpiece with butterflies in their stomach. Little did they know the effect their imagination would have on the dreamers. We know it definitely captured our attention, and we’ve got our eye on what Boxer Metal will come up with next. Watch this space.